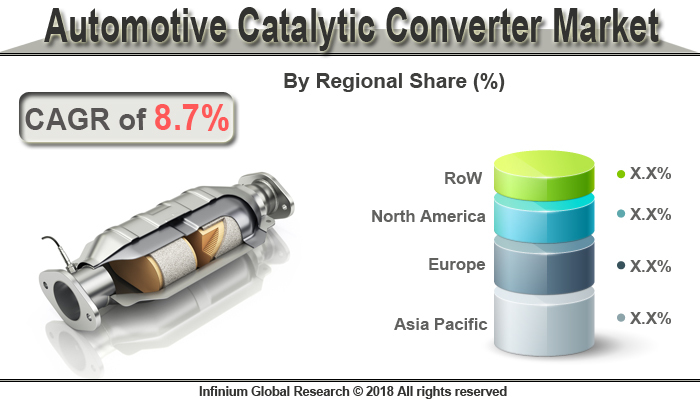 A recent report published by Infinium Global Research on automotive catalytic converter market provides an in-depth analysis of segments and sub-segments in global as well as regional automotive catalytic converter market. The study also highlights the impact of drivers, restraints and macro indicators on the global and regional automotive catalytic converter market over the short term as well as long term. The report is a comprehensive presentation of trends, forecast and dollar values of global automotive catalytic converter market. The Automotive Catalytic Converter Market was worth USD 111.08 Billion in 2017 and is projected to reach around USD 196.60 Billion by 2024. The Automotive Catalytic Converter Market is estimated to grow at a CAGR of 8.7% during the forecast period 2018-2024. The Asia-Pacific region accounted for the largest market share of approximate 61% in 2017 and is expected to remain dominant through the forecast period. The Asia-Pacific region is expected to grow at the highest CAGR of 10.4% during the forecast period. The catalytic converters are accountable for the emission control by converting the toxic gas into non-toxic gases. Harmful carbon monoxide and hydrocarbons are converted to water vapor and carbon dioxide. The Catalytic converters assembly consist of a substrate, mat, shell, and cones. The materials used for the catalyst converter should be able to provide good thermal properties, corrosion resistance, and strength. The catalyst converter is classified because of their mounting positions. The first one is the maneuverer welded on the manifold. The second one is a closed coupled converter that is placed at a distance between 350 and 650 mm from the engine head-face. The third one is the underbody converter placed after the flexible coupling or beyond 650 mm. The suitable converters are selected and positioned in the exhaust system to meet the required emission standards. Growing environmental concerns and strict exhaust emission laws are the major factors driving the automotive catalytic converter market. Additionally, the growing automotive industry is further facilitating growth in the automotive catalytic converter market. There is a significant growth in the sales of passenger vehicles in the Asia Pacific and Latin America region. Besides this, increasing inclination and stringent government regulations towards the adoption of electric vehicles to further facilitate growth in this market. Moreover, rising disposable income in many developing nations to fuel growth in the automotive catalytic converter market. In addition, the introduction of an electric scooter and electric motorcycles are anticipated to boost the growth of the automotive catalytic converter market over the forecast period. On the other hand, increasing demand for fuel-efficient vehicles and increase in advancement in material technology are anticipated to provide several opportunities for the growth of the automotive exhaust systems in the upcoming years. On the other hand, the prominent players are anticipated to reduce the price tensions produced by regional players with the establishment of the strong footprint can be led to increased profits. Moreover, with the adoption of new technologies, the automotive catalytic converter market offers several benefits such as reduced carbon dioxide emissions and improved fuel consumption. Asia Pacific region emerged as the largest region for the automotive catalytic converter followed by Europe. Asia Pacific region houses 60% of the global population. Countries such as China, India, and Japan have the highest number of passenger car sales. In addition, the sales of motorcycles are the highest in countries like India, China, Vietnam, and Indonesia. These automotive catalytic converter systems are utilized in these two-wheelers and 4-wheelers that makes the Asia Pacific market the leading region for the automotive catalytic converter market. Besides this, Asia Pacific region has a high number of local manufacturer that manufactures automotive catalytic converter. With a rising economy and high disposable income countries and increasing awareness about noise pollution and fuel consumption, the Asia Pacific region to remain dominant in this market, throughout the forecast period. On the other hand, growing environmental concerns and stringent exhaust noise laws are anticipated to maintain the dominance in the North American and European markets in the upcoming years. Moreover, automotive sales in this region are expected to witness modest growth in the coming years. The report on global automotive catalytic converter market covers segments such as converter type and vehicle type. On the basis of a converter, type the global automotive catalytic converter market is categorized into two way catalytic converter, three-way catalytic converter, diesel oxidation catalyst, and others. On the basis of vehicle type the global automotive catalytic converter market is categorized into passenger cars and commercial vehicles. The report provides profiles of the companies in the global automotive catalytic converter market such as, Faurecia, Tenneco, Benteler International AG, Magneti Marelli S.P.A, Eberspacher Group, Futaba Industrial Co. Ltd, Calsonic Kansei Corporation, Sango Co.Ltd., Yutaka Giken Co. Ltd. and BASF. The report provides deep insights into demand forecasts, market trends, and micro and macro indicators. In addition, this report provides insights into the factors that are driving and restraining the global automotive catalytic converter market. Moreover, IGR-Growth Matrix analysis given in the report brings an insight into the investment areas that existing or new market players can consider. The report provides insights into the market using analytical tools such as Porter's five forces analysis and DRO analysis of automotive catalytic converter market. Moreover, the study highlights current market trends and provides forecast from 2018-2024. We also have highlighted future trends in the automotive catalytic converter market that will impact the demand during the forecast period. Moreover, the competitive analysis given in each regional market brings an insight into the market share of the leading players. This report will help manufacturers, suppliers and distributors of the automotive catalytic converter market to understand the present and future trends in this market and formulate their strategies accordingly.